America -- nay, the entire world -- went hog wild this week when a report out of England predicted a "global bacon shortage" in 2013. Swinophiles cleared hoarding space in their freezers and eating-contest organizers canceled bacon-based events. But then a few contrarian journalists, most notably Slate's Matthew Yglesias, took to the Internet to reassure everyone that a bacon shortage was no more likely than pigs flying. The truth is somewhere in between. Describing the bacon market today as "the aporkalypse" may be hyperbolic. But the pork industry is under serious stress -- so much so that there is actually a remote chance there could really be a bacon shortage in 2013, just as the United Kingdom's National Pig Association predicted. The main issue recently has been the price of feed, which soared to an all-time-high in August, largely because of a major drought throughout the Midwest. That's driven the cost of the total feed required to raise a pig to the standard market size of 200 pounds as high as $175. Meanwhile, the commodity price of a hog carcass has been fluctuating between $120 and $150 per 200-pounder. That's led some hog farmers to sell their livestock at a loss of up to $50 a head. "The volatility in feed prices is so high that losses can be catastrophic," Minnesota hog farmer Randy Spronk told The Huffington Post. "Producers are trying to decide whether it's still a profitable business to take corn and soy meal, and turn it into protein." As a result, many hog farmers have been "downsizing their herd," University of Missouri agricultural economist Ronald Plain told The Huffington Post, mostly by slaughtering pigs at lower-than-normal weight. Reuters reported Thursday that more pigs were slaughtered early in August than in any other month in U.S. history. That mass slaughter actually led to a glut of pork in the fall. But there will soon be fewer hogs per American than at any time in almost 40 years. Each hog only has one belly. So that also means the amount of bacon available per person will also be lower than ever. Luckily, capitalist economies have a very efficient mechanism for dealing with supply shocks: prices. When the supply of bacon decreases, the price can increase. "There's gonna be bacon," Spronk said. "It's just gonna be sold for higher prices." Compared to agricultural grains (or even a manufactured product like a Furby or an iPad), prices can adjust to changes in supply and demand relatively easily in the pork market, because pigs are slaughtered every day of the year. "If we run out today, we'll have more tomorrow," Plain said. "And we're not going to run out, because if we start to get low inventory, the price steps up. Bellies are selling for $1.13 a pound today -- and if we run out, they'll get more expensive. Packers will be happy to charge you $5 a pound if you want to pay it, and they'll make sure we don't run out." Yglesias could be right that a bacon price hike is far likelier than a bacon shortage, but there are a couple factors that keep the possibility of a true shortage in play. For one, higher prices for pork bellies would seem to encourage producers to produce more hogs, bringing prices down in the long term. But the belly only comprises 14 percent of a hog's total weight, and demand for the other parts of the pig hasn't risen as fast as demand for the belly has -- hence the failure of hog prices to increase as fast as corn prices. So the monetary incentives to make bacon aren't being effectively passed on to hog farmers. "Raising more, when you're losing money on every one you sell, isn't a solution to the problem," Plain said. On top of everything else, a new animal welfare law that will take effect Jan. 1, 2013. throughout Europe. Some European hog farmers have decided to shut down operations rather than retrofitting their farms to comply with the new codes. That could be a huge blow to the supply of pork, especially in Europe. It also may help explain why the original report of a possible shortage came from the pork lobby in the U.K. rather than the U.S.
Plus, grocers could have trouble increasing prices fast enough to keep pace with demand, which could create situations where supermarkets with good prices sell out of bacon, producing mini-shortages throughout the country. Yet industry insiders emphasized that this kind of scenario is, at most, a remote possibility. U.S. Department of Agriculture economist Shayle Shagam said he expected total pork supply to drop by just 1 percent. And Plain said he didn't think bacon prices would rise by more than 10 or 15 percent in 2013, which would mean it will remain cheaper than it was as recently as this August. In fact, what's going on in the bacon market probably won't be so different from what's going on throughout the meat industry. Higher feed prices mean higher meat prices, period. "It's really not news," said Janet Riley, a spokesperson at the American Meat Institute. "We've been talking about rising meat prices for a long time -- but as soon as bacon got attached to it, people started to care." 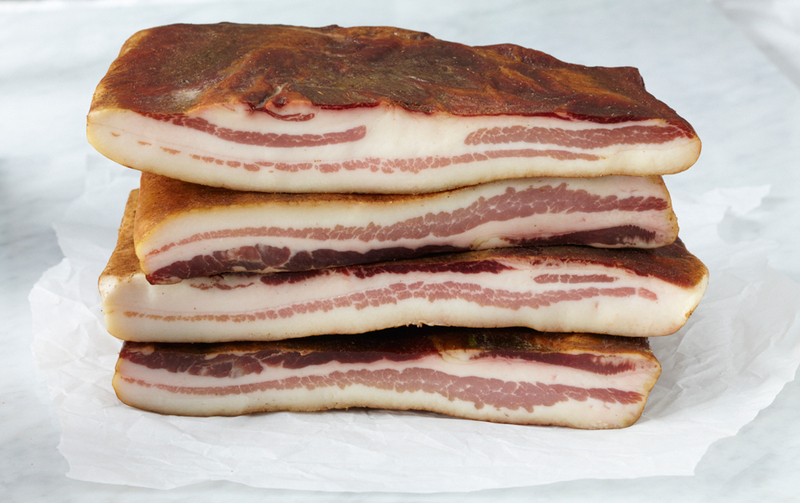 Feast your eyes on the unctuous goodness that is <a href="http://laquercia.us/cuts_belly_pancetta_and_bacon_tamworth_country_cured_bacon">Tamworth country cured bacon</a>, courtesy of artisanal pork purveyors La Quercia. Just look at the gorgeous marbling and imagine the potent flavors of sea salt, bay leaf, rosemary, and black and white pepper! Such fatty, bacon-y goodness! As food blogger Bonnie Farrar writes, it's "the bacon they must order in heaven."